My mom and I took a trip back in time to the two-story Solomon Harkey House, a lovely Federal style structure that stands on the corner of Broad & Water in Hillsboro, Illinois. The home is the oldest in Montgomery County and was built in 1834 by Solomon Harkey. Harkey came from North Carolina with his family, established a tannery then farmed and flourished in what was then a pioneer village. He built a house of brace construction that used bricks to line the interior walls. 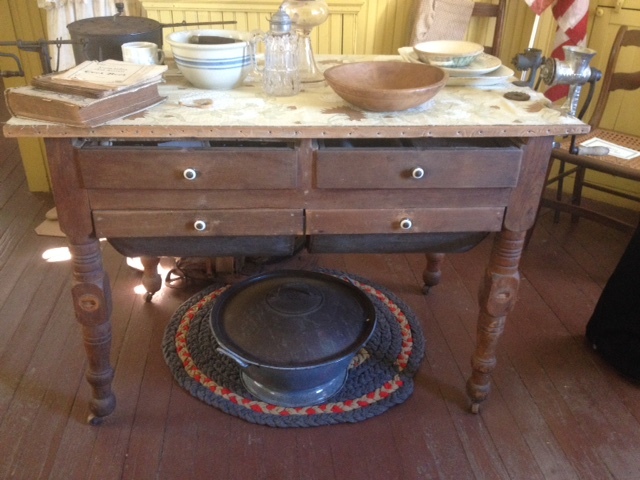 During our visit, we saw many wonderful items within the house, furnishings, paintings, quilts and even a pair of scissors belonging to Abraham Lincoln’s mother, but what hit home for me was the story that my mother told when she saw the bread raiser in the kitchen. When my grandmother (Ena) asked her how she knew she had made bread, she said she could see the soil rising in the back yard where grandma had buried it! It is neat to hear your own family stories when touring a historic home. My grandmother has been gone for many years now, but hearing this story I can picture my quiet grandmother who loved cooking and cooked for her six children and anyone else that happened to stop by kneading bread and enjoying the rhythmic movements this would have taken. Ena Pearcy was not one who needed a lot. She really didn’t need much at all but a good book (primarily Harlequins), a comfortable chair and a bit of quiet. Thank you Harkey House for bringing a bit of my grandmother back to me through my mother’s eyes.